This post will be more technical than my previous posts, so feel free to ask questions in the comment section below. For the sake of this article, my hypothesis is that MJ, my dad and I all descend from the same person, Bartholomew of Bayonne. I also believe that my dad and I descend from Bart’s first marriage while MJ descends from his second marriage. As I talked about in my last post, I’ll only be using my dad’s DNA in this analysis since he and MJ share more DNA, so mine is irrelevant. Why is my DNA irrelevant? As I mentioned in my last post, I do not share any DNA with MJ that my dad doesn’t also share with MJ, making my DNA irrelevant when evaluating this match. Also, my dad will share much more DNA with MJ than I do since the shared DNA is diluted with each new generation. My dad would have more of Bartholomew’s DNA than I do. Now that I have my hypothesis, I want to perform a few experiments to disprove it. I want to test different lines in my tree to see if our common ancestor could be anywhere else but my McDermott line. Fortunately, I’ve been in contact with MJ and she’s just as interested as I am to find our common ancestor. This is an ideal situation because in some circumstances, I needed to ask MJ if she shared any DNA with specific matches. Because Ancestry only shows shared matches between two people if both of those people share at least 20 cm with that match (right around fourth cousins). This can be confusing so let me give you an example. Say MJ and my dad had a true fourth cousin named Fred. As fourth cousins, my dad could share 40 cm with Fred, and MJ could share 19 cm with Fred. On my dad’s core match list, Fred shows up as an estimated fourth cousin. Likewise, MJ sees Fred on her core match list as an estimated fourth cousin. If I were to only look at the list of shared matches between my dad and MJ, I would never see Fred on that list. I would then assume that there is no shared DNA between my dad, MJ, and Fred even though they’re true fourth cousins. I would be dead wrong. For Fred to show in the shared match list on Ancestry, both MJ and my dad would need to share at least 20 cm. To get around this, I need to reach out to MJ and ask if Fred is on her core match list. And if so, what’s the total amount of shared DNA in terms of centimorgans. I was lucky that MJ shared my interest in this specific problem and was able to provide me with the information needed to do the analysis. We knew that if we could solve the problem together, then we could share our other research with each other. My dad has a paternal first cousin who has also tested with Ancestry – we’ll call him JM. According to MJ, she shares 44.2 cm with JM. Because my dad, MJ, and JM all share a good amount of DNA, I know that the shared segments flow through my dad’s paternal grandparents. Therefore, I’ve eliminated half of my dad’s tree – and 75% of my tree in the process! Now I need to figure out which of my dad’s paternal grandparents the shared DNA comes from – his grandfather James McDermott or his grandmother Margaret Connolly. Ethnicity estimates wouldn’t help here since both James McDermott and Margaret Connolly were 100% Irish. When it comes to tracking the flow of shared DNA in complex cases like this one, I like to switch from a basic pedigree chart to something called a McGuire chart. For the sake of this analysis, MJ’s ancestors are labeled ‘unknown’ since I’m trying to place MJ in my genetic tree. The green boxes represent the test takers. Follow each line below the green boxes to see how much DNA they share with other test takers. 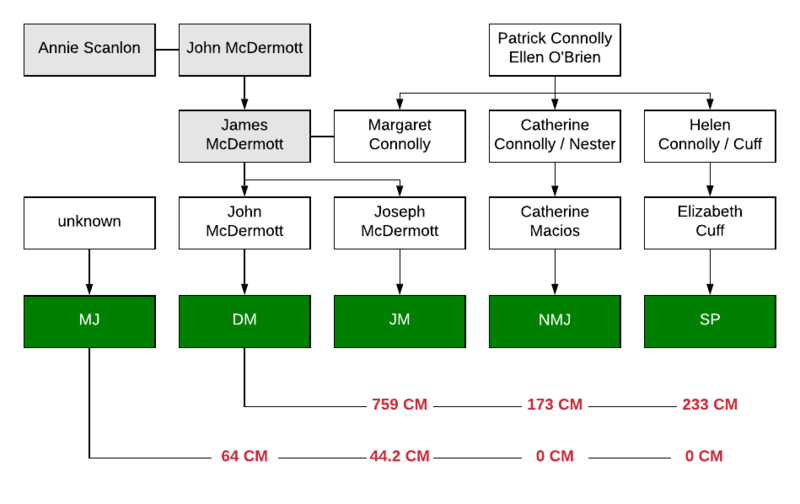 At this stage, I know that the shared DNA flows through either James McDermott or Margaret Connolly as shown above in gray boxes. Because my hypothesis is that our common ancestor is on our McDermott lines, I want to disprove this by testing the Connolly line first. My dad also has several known second cousins who’ve already tested with Ancestry. They descend from Margaret Connolly’s parents, Patrick and Ellen. We’ll call these Connolly cousins NMJ and SP for privacy reasons. According to MJ, she does not share any DNA with any of my dad’s known second cousins on his Connolly line. While it’s absolutely possible for more distant cousins not to share DNA, it’s statistically impossible for 2nd cousins not to share any DNA1. If the shared DNA flowed through my dad’s grandmother Margaret Connolly, MJ would also be 2nd cousins with my dad’s Connolly cousins. This means they would have to share some amount of DNA. 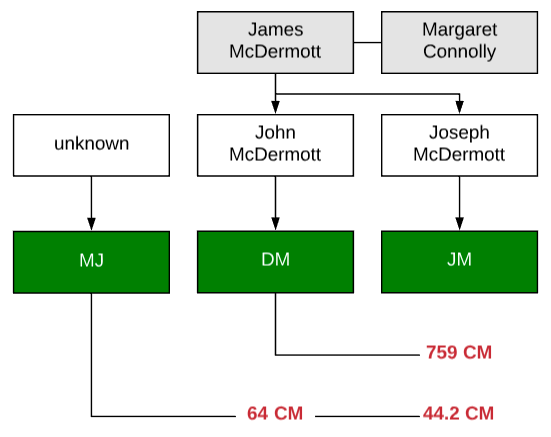 But because MJ does not share any DNA with these Connolly cousins, I’ve now ruled out an entirely new section of dad’s tree. 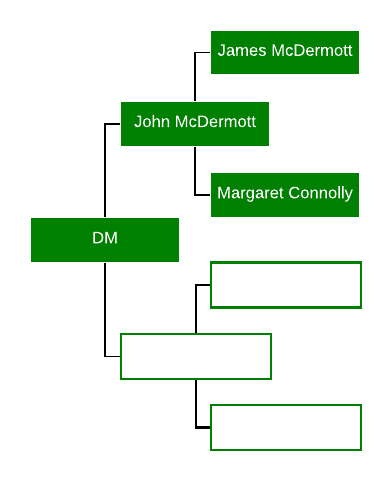 Moving up my tree again, we now have strong evidence that the shared DNA stems from John McDermott and Annie Scanlon, as indicated above with gray boxes. Again, I want to disprove my hypothesis so next I need to look at the Scanlons. Up until this point, I’ve been very lucky with all my known cousins who’ve already tested with Ancestry. But It seems my luck has run out with the Scanlons. Currently, I do not have any known cousins on my Scanlon line who’ve already tested with Ancestry. This is where I start formulating my targeted testing plan. I need to find a living descendant of Annie Scanlon’s parents and ask them to take a test. If the shared DNA came from the Scanlon’s, MJ would be 3rd cousins with a descendant of the same generation. Again, statistically speaking, there’s only a 2% chance for 3rd cousins not to share any DNA2. If I’m really lucky, I’ll find a living descendant who’s one generation older than MJ, so the relationship would then be 2C1R. With 2C1R, the chance of not sharing any DNA drops to 0.1% (statistically speaking). How do I find a living Scanlon test taker? I need to go back to 1850’s Manchester England where Annie was born and then work my way to present day to find a willing test taker. In addition to testing a living descendant of my Scanlon line, I also want to test a living descendant of Bartholomew of Bayonne. But this time it doesn’t make sense to use a standard autosomal test. I want to do a Y-DNA test on a male descendant in Bart’s direct male line, since the Y chromosome is only passed down from father to son. If the common ancestor between MJ and my dad is Bartholomew of Bayonne, my dad and I will share the same Y-DNA with another direct male descendant. For more on this, refer to my guide to DNA testing here. Then, I need to identify their sons, and son’s of sons until I find a living descendant willing to test. And because Y-DNA is inherited relatively unchanged with each generation, it doesn’t really matter which generation I test. This is very different than autosomal testing where you always want to test the oldest generation. So that’s my targeting test plan. To recap, I need to find two test takers. And who knows, there’s always the chance that a new match will pop up on Ancestry before I can even identify the living descendants! I know this post was much more technical than previous posts in this series, so please feel free to ask questions in the comments below. I also want to say that DNA inheritance and shared DNA is very complex and random. I’ve tried my best to simplify some of these complex ideas. All the assumptions made in this post are based on industry-accepted statistics amongst genetic genealogists. For more on this, check out the Shared Centimorgan Project here. 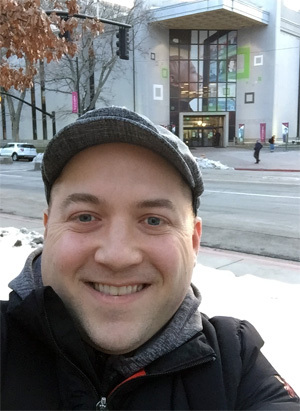 And to learn more about complex DNA topics, I highly recommend reading Blaine Bettinger’s book, Genetic Genealogy in Practice. I also recommend joining his genetic genealogy Facebook group here.